Set up your repeaters on a hard flat, level surface. Make sure you have a clear , open space to shoot with 150 ft. distance between your launch site and the audience or inhabited buildings. Have a hose, fire extinguisher, or water supply at hand for emergencies. Be sure you stabilize your repeater with bricks. Make sure all fuses are covered until ready to use. Use a Phantom Pyro Torch, punk or extended lighter to light. Use a flashlight at night so you can see the fuse. After you light the fuse move a minimum of 20 feet from the repeater. 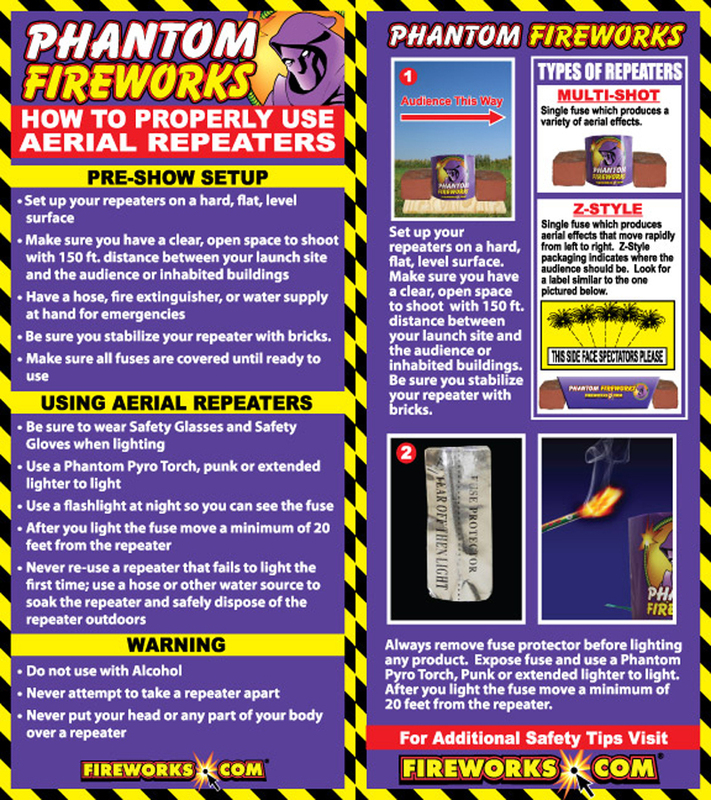 Never re-use a repeater that fails to light the first time, use a hose or other water source to soak the repeater and safety dispose of the repeater outdoors. Never attempt to take a repeater apart. Never put your head or any part of your body over a repeater.